When you think about a gable vent you probably do not think about art or even curb appeal. 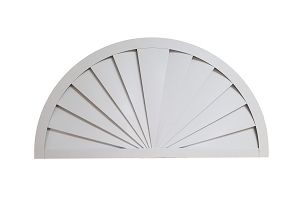 Decorative gable vents can add both to a home. The aluminum gable vents found here are just as beautiful as they are functional. Of course, some decor gable vents are just pretty whether they have been installed or not. Like the Half Round Sunrise gable vent. It is actually vented by 1/2" slots between the slats. 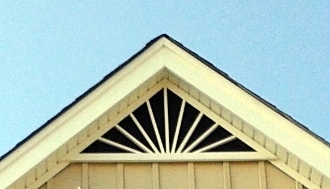 Of course, the choice of the artsy gable vent being functional is of your choice. We offer a screen on the back of the functional decor vents and a metal back on the non functional decor gable vents.